Q Will there be a Red Dwarf XIII? A We certainly hope so! Following the success of the most recent series on Dave, new episodes of Red Dwarf are something that all parties have a keen interest in making happen. As always with the world of TV commissioning and production, however, various things have to be worked out and worked through in order to bring it to the screen. As soon as there's any news on potential new Dwarf, we'll let you know right here on reddwarf.co.uk. Remember, though, that until you see it confirmed by ourselves or Dave/UKTV, any news you may read online about commissioning or filming dates is not official! Q Will new Red Dwarf ever be broadcast in my country? A At the time of writing, episodes from the Dave era of the show have been picked up for broadcast in Australia, the Czech Republic and certain PBS affiliates in the USA. 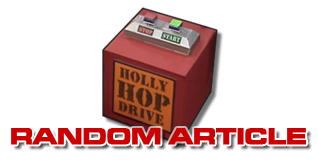 As ever, we'll bring you news on any further international transmissions on this site as soon as we have it. In the meantime, if you are interested in seeing networks in your country license and broadcast the show, it never hurts to get in touch with them to let them know! Q Is Red Dwarf available on DVD and/or Blu-ray? A As of early 2019, every single episode of Red Dwarf is available on both DVD and Blu-ray in the UK (Region 2). The first eight series were released as two- and three-disc sets between 2002 and 2006, including a wealth of extras such as deleted scenes, outtakes, documentaries, cast commentaries, interviews and more. These episodes were also subsequently released on assorted "vanilla" compilation sets, without extra features, titled Just the Shows and All the Shows. 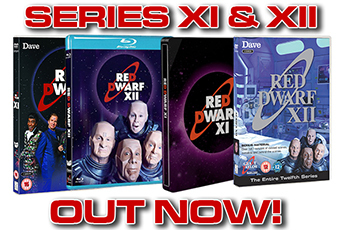 Back to Earth, Series X, Series XI and Series XII all received simultaneous releases on both DVD and Blu-ray. Series X and XI are also available in retailer-exclusive Blu-ray steelbook sets. The Bodysnatcher Collection is a four-disc DVD set featuring all three "Remastered" series, all-new documentaries and commentaries, plus rare unseen footage. Beat the Geek is an interactive DVD quiz hosted by Holly. Just the Smegs collects the Smeg Ups and Smeg Outs VHS tapes from the 1990s, with additional material. The latest Red Dwarf home release is The Complete Series I-VIII on Blu-ray. This edition features newly-upscaled versions of the first eight series, along with all of the extras previously available on the individual release sets. Each individual series release up to and including Series XII is also available in the USA/Canada (Region 1) and Australia (Region 4). These regions have also released some bespoke compilation sets of earlier series. There are also country-specific DVD releases of earlier series in Japan, Spain, Portugal, France, Poland and the Czech Republic. 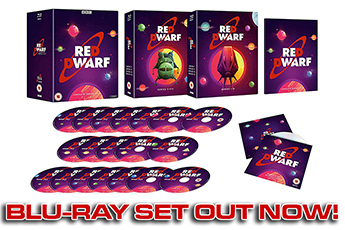 You can browse our DVD section to see the full range of Red Dwarf sets available where you are! Q Why does the new Blu-ray set only contain the first eight series? A The new set sees the first eight series, in newly-upscaled and graded HD, released on Blu-ray for the first time. As the series from Back to Earth onwards are already available in this format (having been originally shot in HD), it was not necessary to include them in the new set! Q Will the new Blu-ray set be made available in my country? A We very much hope for an international release of the set in various regions, but this will depend on its sales performance in the UK. We'll keep you posted! Q Can I watch Red Dwarf episodes online? A Various on-demand platforms offer access to Red Dwarf episodes at different times, for both subscription streaming and download-to-own purchase. Availability varies by region, but keep an eye on our Watch Red Dwarf section for up-to-date links. Depending on their most recent broadcast, both "new" and "Classic" episodes of Red Dwarf sometimes appear on the free UKTV Play on demand service! Q Will the new HD versions be made available for streaming? A At present, the new upscaled versions of Red Dwarf I-VIII are exclusive to the Blu-ray set. We'll let you know if this changes in future. Q Why does this version of Red Dwarf I'm watching feature different music / no audience laughter? A The version of The End made available on streaming platforms such as Netflix features an edit to the background music during George McIntyre's funeral scene. This substitution was made for licensing reasons. The original music appears on all home disc releases of the episode. The "Copacabana" music played during the post-crash sequence in Terrorform was only licensed for its original broadcast transmission, and all subsequent releases (from the VHS onwards) have featured a substituted library version. In 1997, three "Xtended" versions of Series VII episodes Tikka to Ride, Ouroboros and Duct Soup were released on video. Due to Series VII's multi-camera production, its episodes were filmed without a studio audience, and then shown to an audience afterwards to capture the usual laughter track. The "Xtended" editions, however, were not shown to the audience, and so do not feature a laugh track. Some streaming platforms feature these editions rather than the original broadcast versions. Q How many episodes/series of Red Dwarf are there? A As of the end of Series XII, there are 73 episodes of Red Dwarf in total. Series I-VI and X-XII each feature six episodes; Series VII and VIII have eight episodes; and the Back to Earth special is made up of three parts. Although multi-part stories such as Back to Earth and Back in the Red have been edited together into "Director's Cut" editions for DVD releases, for numbering purposes they should be considered as the individual episodes in which they were originally broadcast. We're really not fussy about whether you say "series" or "season", but Back to Earth is not officially designated as "Series IX".